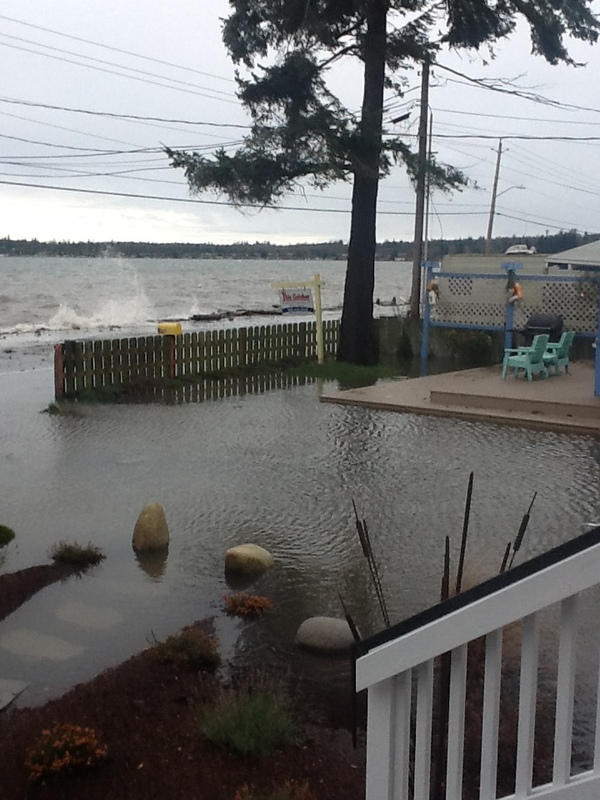 No one who lives in Birch Bay knew the effects that Monday’s storm would have. It was widespread and affected our entire beachfront. Birch Bay Drive was shut down for hours as the storm struck, with logs, gravel and seaweed being tossed into the road, businesses flooded, and serious damage to one local restaurant and it will be days before cleanup is complete. What caused this? A normal 10.5′ high winter tide combined with a low pressure system, high winds and the moon phase. However it was also caused due to the degradation and loss of the natural Birch Bay shore over the last fifty years. It was a stark example of why we need the Birch Bay Drive & Pedestrian Facility Project through Whatcom County. 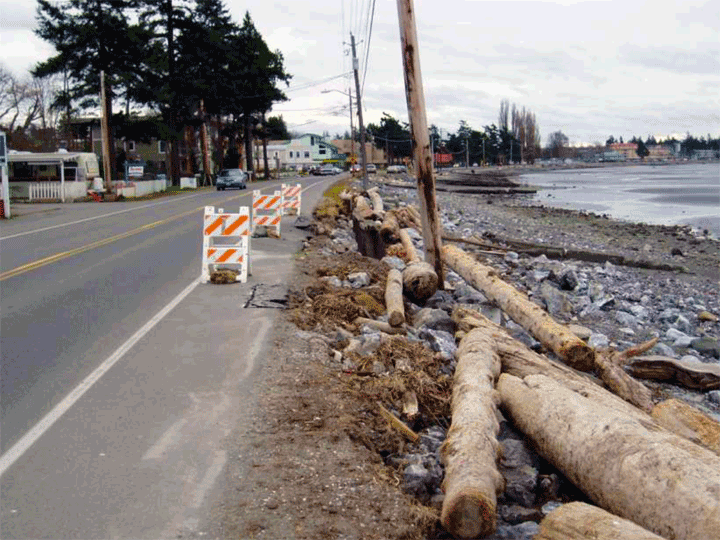 Whatcom County is both committed and moving forward with the Birch Bay Drive & Pedestrian Facility Project which includes the restoration of the Birch Bay Shoreline. This project is happening and has strong support from our Congressional delegation as well as the Washington State Department of Ecology and a host of other Federal, State and Local agencies, as well as support from the Birch Bay Steering Committee and the Birch Bay Chamber of Commerce. During the week of December 3, Whatcom County project staff, along with Kathy Berg representing the Birch Bay Steering Committee and John Gargett representing the Birch Bay Chamber of Commerce, interviewed the five firms responding to the Request for Qualifications to hire a lead Design and Engineering Consultant. The firms were; CH2M Hill, Inc., David Evans & Associates, KPFF, Reichhardt & Ebe, and Reid Middleton, Inc. All these firms gave excellent presentations and Whatcom County is now evaluating the outcome and will enter into negotiations with the finalist. This is a significant step forward for our Birch Bay Community. It is anticipated that the outcome of the selected Consultant’s work will include the design of a restored shoreline, underground utilities, bike lanes and pedestrian walkways. Perhaps the greatest outcome of this restoration of our beachfront may be that the storm effects our community faced this week will be greatly reduced. This is because the loss of our beach, coupled with the rock and concrete sea walls are making matters worse. With the restoration, there will be a restored beach that will enable winter storms to wash naturally up the shore minimizing the risk of overtopping and flooding. The next step, once the negotiation with the finalist is complete, will be the design and engineering study, along with Phase 1 construction that will start in 2014. While the final design is still under development, the following two pictures demonstrate the before (current situation on left) with a possible conceptual design (upon completion on right). This is another exciting step forward for our community! Birch Bay Drive Looking To Harborview Drive. This entry was posted in Birch Bay Chamber of Commerce, Birch Bay Waterfront and tagged birch bay, Birch Bay Drive & Pedestrian Facility, Birch Bay Steering Committee, Washington Department of Ecology, Waterfront Working Group, Whatcom County Washington. Bookmark the permalink. I love the project. I think it will be wonderful. Merry Christmas and a very Happy New year. Love it so much! Can’t wait! Looks great and would make a wonderful addition to Birch Bay. However if the coal terminal at Cherry Point is approved it would not be worth the expense. It will be wonderful improvement to the water front ,love it just keep on track! 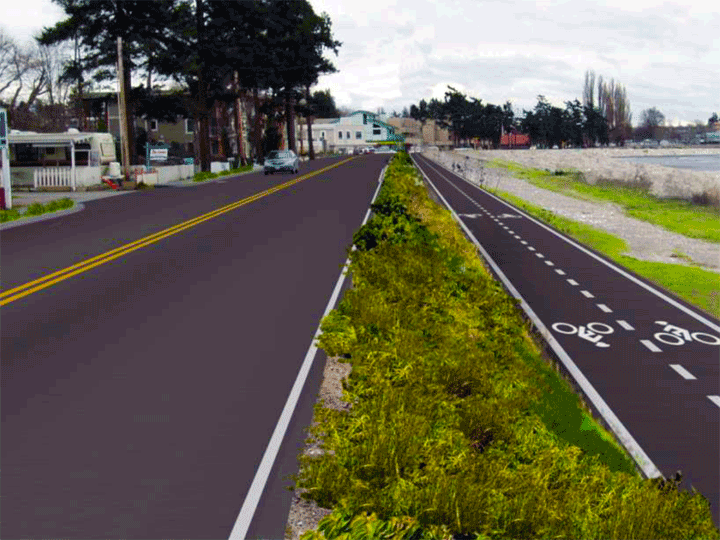 A number of people have commented on the “Conceptual” image for what the Birch Bay Drive and Pedestrian Facility MAY look like. It is NOT by any means a final image of reality, it is a “Conceptual” image. As part of the process, when the finalist is selected, there will be a process where a design is created with input from the community. Why don’t they make the road one way? It will be safer for pedestrians and bikers and won’t take so much beach, concrete and property. I read some of the initial plans and can’t believe no one has suggested this yet. Please refer to the proposal by Dymond Nicon, Architect, Nicon International, Architects and Planners at NiconInternational.com and in Facebook under Birch Bay Promenade. This study and proposal shows how a 60 foot wide Pedestrian Promenade can be incorporated into the commercial strip along Birch Bay Drive from the Via Café to the Bay Market. Thus providing a truly safe and pedestrian friendly community for Birch Bay.